The purpose of the CHRONIC DISEASE PREVENTION COUNCIL is to serve as a coordinating body to address chronic disease prevention in New Mexico. Supporting initiatives to understand, identify, and address social determinants that impact chronic disease. *As identified by the National Association of Chronic Disease Directors. 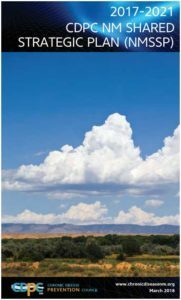 The latest iteration of the New Mexico Shared Strategic Plan (NMSSP) for Prevention and Control of Chronic Disease is here! The NM Shared Strategic Plan for Prevention and Control of Chronic Disease will empower New Mexicans to make changes that create healthier communities. The ultimate goal is to reduce the burden of chronic disease throughout the state. A major shift in this new plan is a whole- system approach focusing on risk factors that affect multiple diseases. It can be viewed below. The previous iteration, CDPC NM Shared Strategic Plan 2012-2016, can be viewed here. Take Action for a Healthy New Mexico! New Mexico Chronic Disease Prevention Council has launched a multiple chronic disease video that gives awareness to those who are suffering from multiple chronic diseases, such as diabetes, heart disease, stroke, tobacco use, cancer, and arthritis. It gives viewers the opportunity to connect with resources in order to overcome their multiple chronic diseases. The video features Wesley Pulkka, who has had cancer, heart disease, is prediabetic, and has struggled with weight control and was a smoker. Pulkka is now 73 and he has had to learn a great deal about his life and health and how to manage chronic diseases that impact many New Mexicans, including his participation in the National Diabetes Prevention Program. Update on life from Wes: I have really gotten back to the studio since Feb. ’14 and have 8 pieces in the works at the moment. I did lose 58 of my 60 pound goal and am aiming to rid myself of another 10-15 pounds. The docs have cut way back on my heart meds and I’m able to maintain a 3 mph walking speed over a two to three mile stroll through the park every day. I can even run flat out for more than 50 yards! I feel great and have the most sustainable energy I’ve had in 20 years. My contract at the Journal has been renewed for 2 more years and I’ll celebrate my 73rd birthday on May 17th. Emily has a solo show coming up at Sumner and Dene in Jan. ’16. I hope folks get the gist of the video because the things we discussed on tape really do work. One of NM Chronic Disease Prevention Council’s biggest accomplishments is the launch of its new outreach campaign: Take Action for Healthy New Mexico. Highlighting the fact that those who need to manage one chronic disease often need to manage multiple chronic diseases, the CDPC recognizes that it needn’t duplicate what each of its council member organizations do so well on their own. The CDPC needs to create a platform from which to increase awareness of multiple chronic diseases and drive traffic to each of its council organizations for collaborative yet more in-depth support. This gave rise to the Take Action for Healthy New Mexico campaign. The Take Action for Healthy New Mexico video is positioned as the first of several such videos which will highlight a diverse group of New Mexicans who are managing their chronic diseases. Alongside the video we have created a comprehensive graphic design system to support all communication (advertising, social media and public relations). The video addresses, in an every-day, conversational, slice-of-life setting, ways to reduce the risk, better manage and/or prevent single or multiple chronic disease. Distribution of the video and its message is happening through the CDPC’s network via University of New Mexico hospital, participating clinic and hospital waiting rooms, and online via the CDPC website and Facebook page. The CDPC also benefits from potential circulation through the NM Department of Health. The CDPC is actively seeking funding by which to embark on our proposed next steps: the creation of additional videos, building a more robust online presence dedicated to the campaign, and a public relations campaign for message exposure and buy-in. The Take Action for Healthy New Mexico campaign improves health outcomes by de-mystifying the complexities of navigating life with multiple chronic disease. By making resources available to everyone on the spectrum of care – from care recipient to care provided – through highly accessible videos and messages, we break down traditional socio-economic boundaries and give the multiple chronic disease community a message around which they can rally their needs and accomplishments.